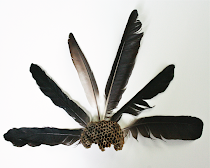 The Plumed Nest: The Homemade Pinata and How to Make a Super Easy One! The Homemade Pinata and How to Make a Super Easy One! Here is another great very simple, very easy craft idea sent into me by Jenessa V. (who also shared with us the cute horse cake decoration). This pinata is easy to make at home for a kids birthday party or any party for that matter! And you can definitely include your kids in this project, but beware there is candy involved! Streamers and other items to decorate the bag. and CANDY of course - for a healthier version, you could place little party prizes inside, goldfish crackers or anything else kids will elbow and step over each other to acquire. Place the two bags inside each other. Place a small layer of crumpled newspaper on the bottom. 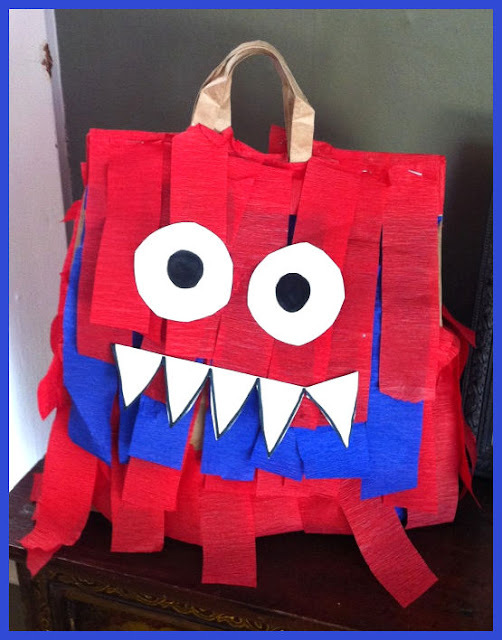 Decorate your bag with streamers and whatever else you have to make your pinata design. Tie your rope to your secured handles, hang where you may, and give your guests a stick to whack the pinata around. Jenessa recently made this pinata and used it at a party. She says it worked really well and lasted through about 15 kids beating on it till the booty feel free. Thanks Jenessa I love this idea and with my twins birthday coming up this friday, I think I am just going to have to test it out! Ooh, I could have used this tutorial for my sons birthday. He wanted a turtle piñata and I couldn't find one anywhere. I'm trying to follow you back but don't see your GFC.... P.s. If you're not on www.voiceboks.com yet you should join for free (and say I sent you). It's a great mommy blog community. You have such a nice blog and you are so talented :), God bless you!!! So good to meet you and stop by your blog. thanks tracy! i checked out and joined voiceboks, what a supportive community!! thanks for letting me know about. all you other mommy bloggers reading this should definitely check it out and join! love your site anne! and thanks for following, i followed ya back : ) and, yes, voiceboks, so far is the nicest online community i have ever came across, i am almost in shock! it's refreshing.